UPDATE III: Of course, Obamney claims that Obama made the economy worse. But even reporters are realizing that the Republi-con "level of dishonesty is almost disarming to reporters and news orgs; it’s so brazen and ubiquitous that it’s hard to know how to attack it. " Read the Washington Post, Probing the depths of Romney’s dishonesty and Faced with good news about economy, Romney dissolves into incoherence. Republi-cons will have to "pick up their game" and tank the economy soon, or TGWLTTGWLLT (The Guy Who Lost To The Guy Who Lost Last Time) (<-- NoBullU.com copyright claim) will lose the election this time. Some argue the news has been even better, "[b]ecause for the past year, the initial jobs reports have consistently been way too pessimistic. Read the Washington Post, Earlier reports prove too pessimistic, which noted that "[i]f you paid attention only to the initial monthly estimates, the economy added just 1.38 million jobs last year. But if you paid attention to the final revisions, the economy actually added 1.82 million jobs last year — twice as much as 2010, and a difference of 440,000 jobs." UPDATE: More bad news for Republi-cons. "The nation’s on-and-off economic recovery has picked up its pace again, the Commerce Department reported Friday, with the U.S. economy growing at an annualized rate of 2.8 percent for the end of 2011. That rate is the fastest recorded in a year and a half, and follows three quarters of growth below 2 percent." Read the Washington Post, U.S. economy in fourth quarter 2011 grew at fastest pace in 1.5 years. As I said in February 2009, tax cuts are not the answer, and again in October 2010, this downturn won't be over 'til the fat lady gets a job. But despite the best efforts of the Republi-cons to tank the economy, "[t]he December jobs report is good news. Very good news. Payrolls increased by 200,000 -- and the growth was spread relatively evenly across the economy. Retail added 28,000 jobs. Manufacturing added 23,000 jobs. Transportation and warehousing added 50,000 jobs -- 43,000 of them in the 'couriers and messenging' subcategory, which suggests some of those gains are temporary holiday hires. Health care added 23,000 jobs. Food services added 24,000. Mining added 7,000 jobs. 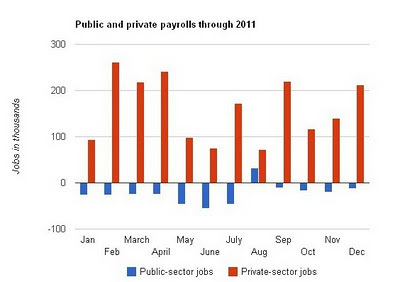 The only payrolls that shrunk in December were government payrolls: we lost another 12,000 public-sector jobs." Expect a lot of panic and denial today from Republi-cons, because it is lookin like it will be Obama in 2012. This claim, like much of what Mr. Romney says, was completely false: U.S. poverty programs have nothing like as much bureaucracy and overhead as, say, private health insurance companies. As the Center on Budget and Policy Priorities has documented, between 90 percent and 99 percent of the dollars allocated to safety-net programs do, in fact, reach the beneficiaries. But the dishonesty of his initial claim aside, how could a candidate declare that safety-net programs do no good and declare only 10 days later that those programs take such good care of the poor that he feels no concern for their welfare? . . .
Romney’s position seems to be that we need not worry about the poor thanks to programs that he insists, falsely, don’t actually help the needy, and which he intends, in any case, to destroy." Read The New York Times, Romney Isn’t Concerned. "Mitt Romney's problem isn't his gaffes. It's probably better to refrain from saying you're 'not concerned by the very poor' and that you 'like being able to fire people,' but campaigns are long, and all candidates make comments that can be taken out of context to make them look bad. Nor is Romney's problem his tax rate, or his wealth, or his time at Bain Capital. Romney's problem is the interaction all of this has with his policies. In particular, the interaction it has with his tax and fiscal policies. Romney's tax policy, described simply, is to extend the Bush tax cuts and, then on top of that, sharply cut taxes on corporations, the wealthy, and upper-middle class investors, while letting a set of tax breaks that help the poor expire. The result, according to the Tax Policy Center, would be a $69 tax cut for the average individual in the bottom 20 percent and a $164,000 tax cut for the average individual in the top one percent. And Romney would pay for this through unspecified cuts to domestic programs. Since domestic programs mostly go to the poor and seniors, the regressive tax cuts would be regressively financed. That's a tough political sell for any candidate. But Romney is a very rich guy who already pays surprisingly little in taxes and has made some oddly callous comments about the poor. And now he wants to lower the tax burden on people like himself, and pay for it by cutting programs for the poor and seniors? That's a much tougher sell." UPDATE V: Expect Obamney to stop talking soon. Read the Washington Post, The too-quotable Mitt Romney and the very poor. "I’m not concerned about the very poor . . ."
Read Politico, Mitt: 'I'm not concerned about the very poor'. Sounds like a campaign sound bite to me. "Romney doesn’t understand his own health reform, which was in large part about ensuring not that you can fire your insurance company, but rather about ensuring that your insurance company can’t fire YOU. . . He evidently has no sense of what it’s like NOT to be the very wealthy son of an already wealthy father; no idea how the fear of unemployment or medical bills afflicts ordinary Americans." "Romney’s sense of privilege, and a relationship to the world around him that is alien to most Americans and reinforces everything that is wrong with the 1% in America. . . When it comes to basic services like healthcare, almost no one in America sees the relationship that way. Most of us wouldn't speak of 'firing' our health insurance company. No matter how much we might detest our insurance company, we probably wouldn't describe the experience of removing ourselves from their rolls an enjoyable one. But most of all, we don't see the health insurance company as providing us a service. We see ourselves, rather, as indentured supplicants forced to pay exorbitant monthly rates for a basic need that responsible people with means can't get out of paying for if we can help it. We don't see ourselves as in control of the relationship with them. They are in control of us-and no more so than when we get sick and need the insurance most. If the company decides to restrict our coverage or tell us we have a pre-existing condition after all, we're in the position of begging a capricious and heartless corporation to cover costs we assumed we were entitled to based on a contractual obligation. It's precisely when we need insurance most that we're least able to 'fire' the insurance company." "As a private equity firm, Bain’s goal was to maximize return on investment (ROI) for a small group of high net worth investors. . .
Any jobs Romney or Bain 'created' were thus incidental to their real function, which was (as Last points out) to maximize shareholder value and goldmine the remaining value of the company so that it might more profitably be used elsewhere. Nothing wrong with that, but don’t try to sell it as 'job creation' . . .
A 'job creator' [give] employment to . . . people through the force of his own creative imagination. 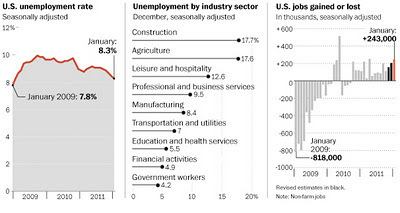 But to call corporate restructuring 'jobs creation' won’t fly." Read National Review, The Battle of Bain Capital. Romney’s claim throughout his campaign that his private sector experience almost uniquely qualifies him to be president is also silly. Does he really think that having done well in private equity, venture capital, and business consulting—or even in the private sector more broadly—is a self-evident qualification for public office? . . .
Post 2008, capitalism needs its strong defenders—but its defenders need also to be its constructive critics. The Tea Party was right. What's needed is a critique of Big Government above all, but also of Big Business and Big Finance and Big Labor (and Big Education and Big Media and all the rest)—and especially a critique of all those occasions when one or more of these institutions conspire against the common good. What's needed is a willingness to put Main Street (at least slightly) ahead of Wall Street, and a reform agenda for capitalism that strengthens it, alongside an even more dramatic reform agenda for government that limits it. Bain Capital shouldn’t be demonized. It may not even deserve to be criticized. But in laying out a way forward, conservatives might remember that Bain Capital isn’t capitalism, that capitalism by itself isn’t freedom, and that there are more things in heaven and earth than are dreamt of in the Gospel of Wealth." Read the Weekly Standard, From Bain to Main. UPDATE: The Republi-CON establishment is starting to recognized "the perils [they] face if their nominee — and the GOP in general — are identified with the brand of unrestrained [unfettered, everyman-for-himself, screw-the-working-guy] capitalism Romney’s Bain years embody. Read the Washington Post, Calling for a truce in the Bain wars. I bring this up because Romney should not be surprised if — no, when — he gets the same treatment after what he said this morning in Nashua, N.H. It’s a line that could be easily ripped out of context and would be equally outrageous." Read the Washington Post, Mitt Romney’s unforced error: 'I like being able to fire people'. Get ready Romney, because what goes around comes around. UPDATE: Republi-CONs believe that "Obama deserves the blame for every dollar of debt that was amassed under his presidency, as once you become president, the federal government is yours to run. That’s a fair argument, though it seems a little self-serving: Obama entered office immediately after the [Bush] administration . . . pushed revenues far beneath spending and failed to effectively regulate the financial sector or the housing sector. In the quarter before Obama entered office, the economy shrank at an annualized rate of nine percent. Two weeks before he was inaugurated — but before Bush had left office — the Congressional Budget Office released a report forecasting a $1.2 trillion deficit for 2009. That was all due to policies and conditions predating Obama. It has been convenient for the Republican Party to blame the resulting deficits on the Obama administration. But this is a bit peculiar: If a house catches fire and damage is done in the time it takes time to put out the blaze, should the blame go to the people fighting the fire or the people who allowed the fire to begin in the first place? The latter, I think. Which is why, in my column, I was trying to isolate the fires Obama’s administration had started. But perhaps the more generous way to phrase [the Republican] point is that Obama should have turned immediately to reduce the 2010 deficit. But that would have been an economic disaster, as [Republicans] knows. So perhaps the argument is that he should have turned more quickly to long-term deficit reduction. The Obama administration could have spent, say, 2010 pursuing a long-term deficit-reduction package rather than financial regulation. One answer is that the White House has, through 2011, tried to come to some sort of deficit-reduction deal with the Republicans, but has been unable to get them to accept higher taxes as part of a package." 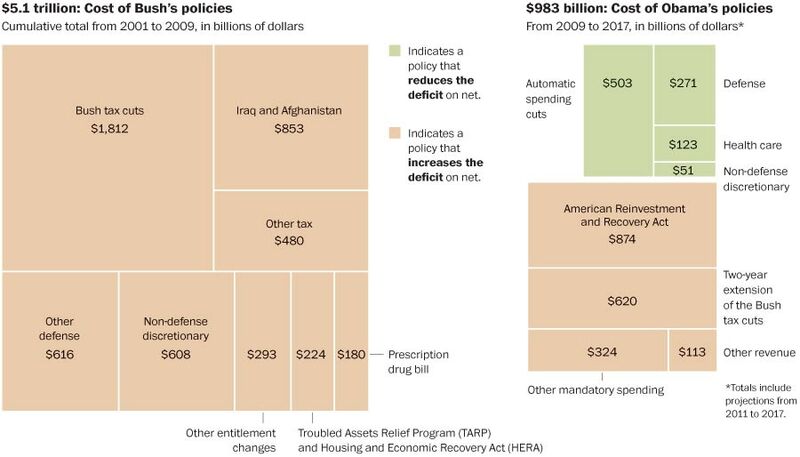 Read the Washington Post, Doing the math on Obama’s deficits, cont’d. How much did Obama add to the national debt? First you must know which of Obama’s policies added to the debt? "The Center on Budget and Policy Priorities . . . [came] up with a comprehensive estimate of Obama’s effect on the deficit. . . In total, the policies Obama has signed into law can be expected to add almost a trillion dollars to deficits. 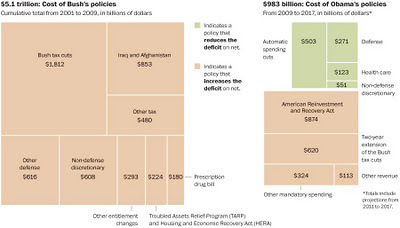 But behind that total are policies that point in very different directions. The stimulus, for instance, cost more than $800 billion. So did the 2010 tax deal, which included more than $600 billion to extend the Bush tax cuts for two years, and hundreds of billions more in unemployment insurance and the payroll tax cut. Obama’s first budget increased domestic discretionary spending by quite a bit, but more recent legislation has cut it substantially. On the other hand, the Budget Control Act — the legislation that resolved August’s debt-ceiling standoff — saves more than $1 trillion. And the health-care reform law saves more than $100 billion. For comparison’s sake, using the same method, beginning in 2001 and ending in 2009, George W. Bush added more than $5 trillion to the deficit."